A few days ago, I wrote a blog post about India's inflation crisis. For five years now, in every single month, the y-o-y CPI inflation has exceeded 5%. Under these conditions, economic agents have little confidence that RBI cares about inflation. They are now reporting double digit inflationary expectations. Under these conditions, inflation will be persistent. By itself, inflation is not going to go back to the target range of 4 to 5 per cent. This blog post made certain qualitative claims about fighting inflation under two scenarios: when the central bank has credibility and when it does not. I recently came across a fascinating paper which is about a similar situation: it is about the problems faced in Ghana recently, in fighting back an inflation. It gives numerical values which are interesting for us. Their inflation was a bit worse than ours - they were at 20%. But for the rest, this analysis illuminates what we face in India today. The paper is : A model for full-fledged inflation targeting and application to Ghana, by Ali Alichi, Kevin Clinton, Jihad Dagher, Ondra Kamenik, Douglas Laxton and Marshall Mills, IMF Working Paper, 2010. The nominal rate is required to go all the way out to 26%. Inflation responds slowly. It is projected to get to the target (with some overshooting at first) by 2016. The cumulative damage to GDP growth, in this process of exorcising inflation, works out to roughly 20 per cent of GDP. (This is the sum total of the output cost over all the years taken in wrestling this inflation down). This is much nicer story. 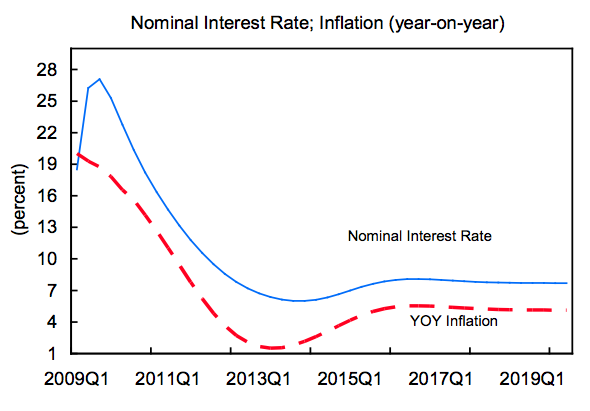 The nominal interest rate starts out high (18%) but inflation responds rapidly and the interest rate can also come down rapidly. 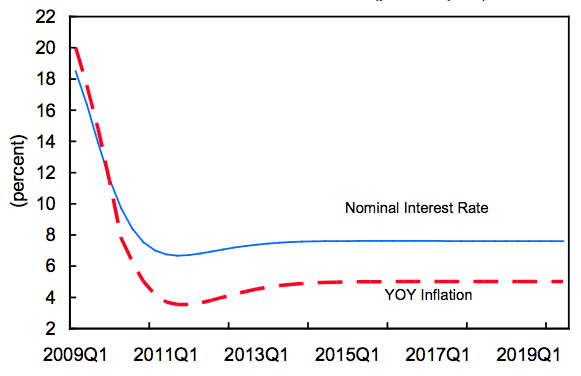 By 2013, inflation is at the target. The cumulative damage to GDP growth, in this process of exorcising inflation, works out to only 4% of GDP. This difference is striking. Lacking credibility, the central bank has to force a total output loss of 20% of GDP, and they get to target inflation by 2016. With credibility, the job gets done three years sooner, and at a cost of only 4% of GDP of output loss. This is an essential insight into our inflation crisis today. In the end, raising rates will get the job done. No matter how bad is the monetary policy transmission, no matter how deeply ingrained inflationary expectations have become, raising rates will ultimately deliver price control. The choice that we face is between being bloody-minded about it, or simultaneously undertaking RBI reforms which involve zero output loss, and improve RBI's credibility. 1) Won't high interest rates merely replace bank finance with FDI as FII's will borrow abroad and invest here to exploit interest rate arbitrage? 2) What is the best way to short GOI bonds over a period greater than 1 year? GOI and RBI saved real estate companies during 2008 by restructuring their loans. This keeps the asset price bubble in the system. Common man never understood why GOI and RBI did this. This also leads to wage price spiral. In any case, common man does not believe wpi inflation, as they have found that realized inflation is more than 15%. RBI baby steps is not going to help. Sir, the central theme of your post is that ultimately the monetary policy will counter inflation but at a cost of GDP ..
2) there is so much fiscal slippage and leakage all the time in our country. 4) growing earning population of India which means demand will not subside for a long time , it will come up again and again resulting in repeat of the inflation cycle. I agree that increasing interest rate will ultimately raise the price of money but will it really check inflation? Therefore will rate hike ultimately rein in inflation by controlling the price of tradables and non tradables ??? If yes , kindly suggest how..and if I am wrong in my understanding kindly correct me..